Super sweet happy girl. 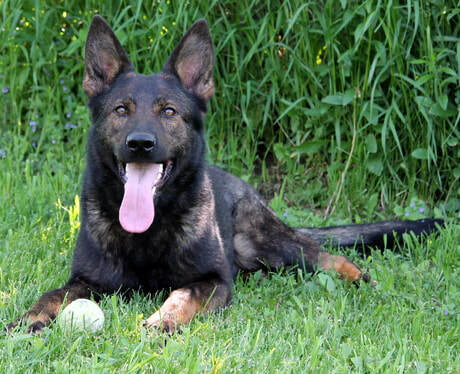 SAR prospect, dog sports, experienced active family. This girl is awesome! She's full of life, happy, confident. She's started on crate training, been vetted, first 2 vaccines and ready to go. Sassi is a super active, fun, ball crazy girl. She'd love to have someone who will spend time outside playing ball, hanging out and just letting her run. Sassi has a wonderful temperament with people. She's an outstanding property protection dog. She is crate trained, house trained, social, great tracking nose. She is high in prey.Sassi will be available late 2018 after her final litter. Shakira is a super active, fun, ball crazy girl. She'd love to have someone who will spend time outside playing ball, hanging out and just letting her run. Shakira has a very nice temperament, good with people and older kids. Shakira can be pushy and over bearing at times but is trained and responds well to commands. She is crate trained, house trained, social. Shakira will be available late 2018 after her final litter.